An exploration of the family tree of Warren Buffett. Special thanks to John Brandon, who created the significant impetus for this Knol by his post to Gen-Medieval@rootsweb.com, which I mention below. 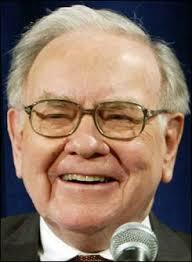 Warren Buffett's Wikipedia entry states that he was born 30 Aug 1930 in Omaha, Nebraska. They there do not give any source for this birthdate or location, but it's repeated in Andrew Kilpatrick's book also including the information that he was born at the "old Doctors Hospital in Omaha". ("OPV", p35) He was the only son of Howard Homan Buffett and his wife Leila Stahl. Howard Buffet's Wikipedia entry states that he was born 13 Aug 1903 and died 30 Apr 1964. 1910 Census of Ward 7, Omaha, Douglas County, Nebraska, Sheet 60B showing : "Ernest P Buffett, 33, married first time, 12 years ago, NE/NY/NY, Grocer; Hetta Duval Buffet, 32, married first time, 12 years ago, mother of 5, 5 living, WV/WV/WV; Clarence D, 11; George M, 8; Howard H, 6; Fred W, 4; Ruth A 2/12"
1920 Census of Ward 9, Omaha, Douglas County, Nebraska, Sheet 224B showing : "Ernest P Buffet, 42, NE/NY/NY, Proprietor, Grocery Store; Henrietta 46 WV/WV/WV; Clarence D 28; George 18; Howard H 16; Fred 13; Alice 10"
1930 Census of Ward 9, Omaha, Douglas County, Nebraska, Sheet 214B showing : "Howard H Buffett, 26, married at 22, NE/NE/WV, Salesman, Bonds; Leila Buffett, 25, married at 21, NE/PA/NE; Doris E Buffett, 2 2/12 NE"
Leila Stahl was born about 1904/5 in Nebraska, in Cuming County, the daughter of John Ammon Stahl (b.1867), a native of Pennsylvania by his wife Stella F Barber (b.1873) of Nebraska. Leila married in 1924/25, probably in Omaha, Nebraska to Howard Homan Buffett, a native of that place. They had three children, with Warren being their middle child between his two sisters, all born in Omaha. In 1942 the family moved to Washington, D.C. where Howard had just been elected to Congress. "Buffet...was 66 when his mother died" ("OPV", p55), so she died in 1996/7. 1900 Census of Bancroft, Cuming County, Nebraska showing : "John A Stahl, Stella F, Marion, John L Barber, brother-in-law, Ford B Barber, brother-in-law"
1910 Census of West Point, Cuming County, Nebraska showing : "Ammon Stahl 43; Stella Stahl 36; Marion Stahl 10; Bernice Stahl 8; Leila Stahl 6; Edith Stahl 4"
1920 Census of West Point, Cuming County, Nebraska showing : "J Ammon Stahl 53; Stella Stahl 46; Marion Stahl 20; Bernice Stahl 17; Leila Stahl 15; Edith Stahl 13"
1900 Census of Ward 4, Omaha, Douglas County, Nebraska showing : "Ernest Buffett, Feb 1877, married 2 years, NE/NY/NY; Henrietta D Buffett, Jul 1870, WV/WV/WV, mother of 1, 1 living; Clarence D 1; Arthur Baldwin, boarder"
WWI Draft Registration Card : "Ernest Platt Buffett, born 3 Feb 1877, Grocer, nearest relation: Mrs Henrietta Buffett"
1930 Census of Omaha, Douglas County, Nebraska showing : "Ernest P Buffett, 54, NE; Alice 20; Cora V Bunce, housekeeper; Marjorie Bailey, stepdaughter"
1910 Census of Ward 7, Omaha, Douglas County, Nebraska, Sheet 60B showing : "Ernest P Buffett, 33, married first time, 12 years ago, NE/NY/NY, Grocer;Hetta Duval Buffet, 32, married first time, 12 years ago, mother of 5, 5 living, WV/WV/WV; Clarence D, 11; George M, 8; Howard H, 6; Fred W, 4; Ruth A 2/12"
John Ammon Stahl was born Jan 1867 in Pennsylvania. In 1898/9, probably in Nebraska, he married Stella F Barber, a native of that state. They had several children, including Leila Stahl in Nebraska. Stella F Barber was born Dec 1873 in Nebraska, the daughter and evidently eldest child of Ford Bela Barber and his wife Susan Anne Watson. By 1880 the family is listed living in Logan, Cuming County, Nebraska and it's possible that Stella was born here. In 1890 the family is living in the town of Bancroft where Ford enters his name in the Special Veterans Census that year. He states that he served as a sergeant in Ohio. In 1898/9, probably in Nebraska, and possibly in Cuming County, Stella married John Ammon Stahl who had moved there from Pennsylvania. They had several children, including Leila Stahl in Nebraska. Her mother Susan is supposed to have died in 1899 possibly in Nebraska. Her father Ford moved to Los Angeles from where he files an invalid pension based on his Civil War service, and from where his next wife Addie, now his widow, files for a widows pension later. Meanwhile Stella's brothers John and Ford Barber (Jr) show up living with John Stahl and his wife Stella in the 1900 Census. Sidney H Buffett "from Dix Hills on Long Island, New York" ("OPV", pg 35) moved to Omaha and opened a grocery store in 1869. John Drake (1590-17 Aug 1659) married Elizabeth Rogers (d.1699) (citation) However on 31 May 2009 J Higgins suggested on soc.genealogy.medieval (citation) that "...the archives appear to indicate that the immigrant John Drake of Windsor, Connecticut, was not of the Drake family of Devonshire, as shown in the source you cite." M. Hollick then agreed and suggested a look at TAG 65 (1990):87--8; TAG 63 (1988):193-206. Douglas Richardson states that this John Drake of Windsor originated in Hampton-in-Arden, Warwickshire and that his wife and mother of his sons was Lettice Shakespeare daughter of Anthony. Margaret Courtenay (thePeerage.com) (Leo van de Pas points out here that Margaret could not have been born in 1377 with this ascent, so I've removed her dates until they can be properly sourced.) J Higgins suggests: "See the group archives for April and May 2001 for a discussion by Louise Staley and others as to which Hugh Courtenay was the father of Margaret who married Theobald Grenville. As Leo indicates, chronology indicates that it cannot be the Hugh Courtenay mentioned in this supposed royal descent for Warren Buffet." Since the above line is hopelessly broken, Fred Chalfant has supplied a new line to test.